Boyd Martin's barn at True Prospect Farm, Phillip Dutton's eventing base in West Grove, Pa., was completely destroyed in an overnight fire. Photo by Amy Dragoo. 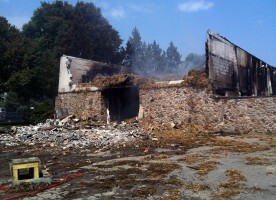 At 12:30 a.m. on Tuesday, May 31, a fire destroyed Boyd Martin’s barn at Phillip Dutton’s True Prospect Farm in West Grove, Pa. Six horses died and many others were injured. Martin’s assistant Lillian Heard was staying with a friend above the barn for the night and smelled smoke shortly after midnight. Brown and several other neighbors did what they could to rescue the 11 horses in the barn. Employees Ryan Wood, Caitlin Silliman and Heard were able to remove five horses, and afterward they were treated and released from Jennersville Regional Hospital in West Grove for minor burns. Four horses—Neville Bardos, Otis Barbotiere, Catch a Star and Ambassador’s Rose—are currently at the George D. Widener Hospital for Large Animals at the University of Pennsylvania’s New Bolton Center for treatment in Kennett Square, Pa. Martin is there with them, and there is no word yet on their condition. The horses lost in the fire were Call Me Ollie, Charla, Ariel, Phantom Pursuit, Cagney Herself, and Summer Breeze.